Introducing the term Player Centered Design provides Kumar and Jerger with a basic pivotal point for organizing the content of Gamification At Work. 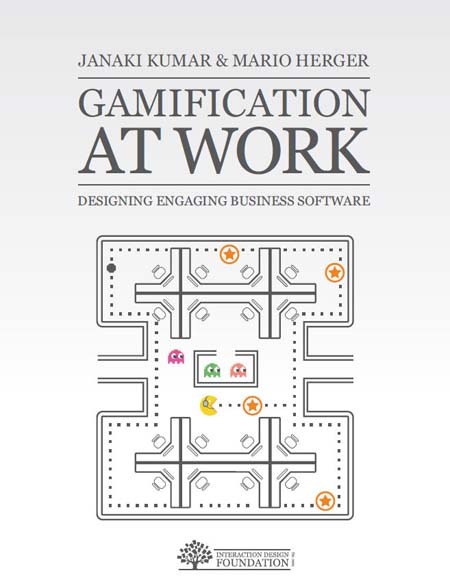 The book starts by quoting Gartner research regarding the near-term focus placed on gamifying workplace activities, and the long-term prospects of success for the projects involved. 80% of current gamified applications will fail to meet business objectives, primarily due to poor design. Given the importance of design to efforts on the part of enterprises to gamify workplace activities, Kumar and Jerger’s effort is commendable in itself. Though Aaron Dignon’s earlier work Game Frame attempted to lay out a framework to use in designing games at work, its main drawback in my reading was an overly crude attempt to legitimate gamifying efforts with a fairly simplistic reading of neuroscience findings about the brain. Player Centered Design keeps the following points in mind. Gamification is about thoughtful introduction of gamification techniques that engage your users. Gamification is not about manipulating your users, but about motivating them. Ultimately, it is about good design — and good design treats the user with respect. While effectiveness, efficiency, and satisfaction are worthy goals, gaming and gamification extends and adds increased engagement to these goals. In the context of a game, players voluntarily seek challenges to enhance their playing experience. They seek empowerment over efficiency, delight and fun over mere satisfaction. These factors increase their level of engagement in the game. Understand human motivation — probably the most difficult of all the guidelines to adhere to without making unwarranted assumptions, as implied in point 1. However, the Platinum Rule offered by Kumar and Jerger offers a useful rule of thumb: “Do unto others what they want done unto them”. Apply game mechanics — the UI elements players interact with such as badges, points, leaderboards (etc.). Manage, Monitor, and Measure — by this they mean gamification is a program and not a project. Missions develop over time, motivation requires active monitoring, and measurements feed into iterations of the game. designs that gamify are best…if the aim is to evoke the voluntary, ongoing engagement of participants. I emphasize the importance of voluntary experience because if you can’t quit playing when you want to the experience is not a gameful one. It is important to plan for player fatigue. When gamification is introduced, players may be engaged and delighted. However, as time goes by and the novelty wears off, player engagement and delight may go down as well. One strategy to counter player fatigue is to plan for a few releases ahead and introduce new features periodically to sustain novelty and interest. A similar strategy is to consider the players’ journeys and their level of expertise with regard to the gamified system. Introduce a small set of features in the beginning as the player is onboarding, and unlock more functions as the player acquires more skills. In other words, the player’s journey is not simply a “game mechanic” as they characterize it earlier in the book. Rather, the journey of players is an architectural feature of gameful design, especially if you consider their engagement voluntary. Regardless of this criticism though, Kumar and Jerger’s overview of how motivation, mechanics, and monitoring works is informative. It offers practical insights and makes tools available, such as the Player Persona Template (p. 46). They also provide numerous informative examples of uses made of gamification at SAP. In addition to their focus on how to design for games in the workplace Kumar and Jerger provide a useful discussion of the legal and ethical considerations to keep in mind, especially when designing games for global enterprises. This entry was posted on Monday, June 24th, 2013 at 8:06 pm and is filed under Change Management, Collaboration, Customer Experience, Ethnography, Experience Design, Gameful Design, Learning Experience, User Experience. You can follow any responses to this entry through the RSS 2.0 feed. You can leave a response, or trackback from your own site. Not sure what you are seeing but I use Firefox all the time and it looks fine. I’ve been working with online game-based corporate training programs for quite some time and wanted to add to your post that these methods have been shown to be effective for all learning styles including visual learners, social learners, and physical learners. I’m not questioning the support of gamification for learning styles. I agree they are useful. I disagree that extrinsic incentives can motivate over the long term without careful design for the game as a personal journey.